It is the ultimate quest for the ultimate treasure: chasing a map tattooed on human skin across an omniverse of interesting realities to unravel the future of the future. Kit Livingston's great-grandfather appears to him in a deserted alley during a tumultuous storm. He reveals an unbelievable story: that the ley lines throughout Britain are not merely the stuff of legend or the weekend hobby of deluded cranks, but pathways to other worlds. To those who know how to use them, they grant the ability to travel the multi-layered universe of which we ordinarily inhabit only a tiny part. One explorer knew more than most. Braving every danger, he toured both time and space on voyages of heroic discovery. Ever on his guard, and fearful of becoming lost in the cosmos, he developed an intricate code - a roadmap of symbols - that he tattooed onto his own body. This Skin Map has since been lost in time. Now the race is on to recover all the pieces and discover its secrets. But the Skin Map itself is not the ultimate goal. It is merely the beginning of a vast and marvelous quest for a prize beyond imagining. The Bright Empires series - from acclaimed author Stephen Lawhead - is a unique blending of epic treasure hunt, ancient history, alternate realities, cutting-edge physics, philosophy, and mystery. The result is a unpauseable, fantastical adventure like no other. Wasnt sure about this one at first but kinda glad i kept listening. Well done. Kit walks down an alley with his great grandfather (who should be dead) and ends up in a fishing village many years in the past. And so it goes. It's fun to watch Kit and his friends try to figure out how to navigate another time in history, such as Kit's girl friend, who ends up in the 1400's and now has to find a job! The story builds on the ley lines of England - linear arrangements of trees, roads, rocks, etc. that have captured the imagination of many over time. The pace of the book is just right - it keeps moving and you want to see what's around the next bend. It does jump around, because different groups of characters are being developed in different parts of history, so that can be a little confusing. This the first book in the series and the second book, the Bone House, is just as good! Simon Bubb does a good job of reading and is a good match for the story line. As for Lawhead, this is one of the better Lawhead books I've read. I like this better than "Hall of the Dragon King" and better than the Albion series. On par with the King Raven series. I liked the first three books of the Pendragon series better. Most of what I've read from Lawhead so far has been historical fiction steeped in Celtic and Christian lore, all of which I've heartily enjoyed without fail. I love his writing style, I love the verisimilitude he brings to the tale, and I love his character development. When I happened upon this series, which is a complete departure from everything I know of his work, curiosity got the better of me. This one purported to be "a unique blend of epic treasure hunt, ancient history, alternate realities, cutting-edge physics, philosophy, and mystery." I can't pass up a description like that from an author I respect! Sadly... I'm not yet impressed. Part of it may just be that I can imagine quite a bit, so I was led on by this description with higher hopes. And part of it may be that this isn't Lawhead's finest hour. The ideas are grand enough, don't get me wrong, and there is plenty of potential to be had. But so far most of the characters aren't very well developed, especially by comparison of his other work, and the scale of this adventure doesn't seem quite so epic as it's hinting to be. That said, Lawhead hasn't let me down yet, and what he's dropped into place has plenty of room to grow in a wide variety of directions, so I'm willing to give him the benefit of the doubt. For the first time, I'm not chomping at the bit to burn through the rest of a series by this author, but curiosity and past experience will definitely bring me back soon enough. Simon Bubb is a worthy narrator for this series, capturing the flavor of the adventure seemingly with ease. My only complaint is that there are some issues about the audio recording itself that are unprofessional at best. It sounds like the mic is set up in a cave somewhere, so there's a hollowness to Bubb's voice that shouldn't be there. Also, there are a few points here and there where it sounds like somebody's hitting the mic stand or a table or something. It's distracting in the moment, but it doesn't happen so often as to be too annoying. Bubb deserves a better production team, I think. I'd love to hear more of his work on another series. The Skin Map is the first book in the amazing Bright Empires Series by Stephen Lawhead. Kit Livingstone meets his Great Grandfather who supposedly went missing after going out to get a loaf of bread. He introduces Kit to ley line travelling, who in turn introduces his girlfriend Wilhelmina to travelling via ley lines, although she gets separated from Kit and travels to 16th century Prague. Wilhelmina meets a baker looking to open a bakery in Prague, and together they open a successful bakery and Kafeehaus. Kit meanwhile is travelling with Cosimo looking for her, and learning more about travelling. Meanwhile in a different time and place Arthur Flinders Petrie is having a skin map tattoed on his body, and Burleigh, enemy of Arthur and Cosimo is travelling around trying to get his hands on the skin map. A great adventure series where science, history and fiction all mould into many incredible stories. I like this narrator. In general, a deeper male voice with a British accent is just nice to listen to regardless of the story. The story is fun too though! Its light and exciting. It does leave you hanging, just to warn you, but I like having discovered this series and that there is more to be had. The Publishers Summary is a little missleading. I thought the novel would be about the protagonists traveling from magical place to magical place via Ley Lines looking for treasure, but instead it's about about the protagonists traveling from place to place on our earth, to different time periods looking for a treasure, so the magic is traveling via the Lay Lines to find the treasure. I'm not a big fan, but this book really grabbed my attention a few chapters in and I became fully engrossed in it. I suppose that if there is more magic in the series that it will be introduced further in the series. The first book is really good, but not excellent, and I felt the same about the story, hence the Four Star rating. I'm excited about continuing the rest of the series, and happy to see that there are four more books in the series on Audible, so I've already purchased, and downloaded book two, and will be starting it as soon as I finish this review. Narrator Was OK. Liked Adam Verne better. What three words best describe Simon Bubb’s performance? He was good but I liked Adam Verner who read the King Raven series a lot better. Was The Skin Map worth the listening time? Yes. I really liked the story. The book was well performed, moved along at a good pace, clean and enjoyable. Can't wait to hear the rest of the series. 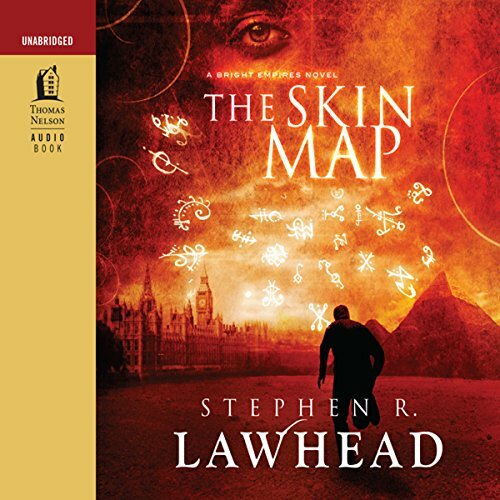 Would you consider the audio edition of The Skin Map to be better than the print version? I love leaping with Kit, Mina and the gang. On to the next adventure, more fun awaits us, keep reading! Some details are probably historically accurate as far as physical descriptions are concerned (clothing, buildings, landscapes); however, the religious tolerance is over the top for most of the times and places visited. Expect a very conservative Christian view of history. Religious people are ‘good’ and non believers are ‘selfish and evil’. He is clearly trying to sell his own bias and it is alienating to this reader. The book also became increasingly boring. The Prague plot line was interesting for a bit but couldn’t carry the entire book. I just didn’t find the majority of the characters to be likable. While most part of the story is interesting, it is also very predictable. To me Simon Bubb’s narration that bought me to this book and he didn’t disappoint me. Excellent to listen. Now to second part, hoping the plot is better then The skin map. Despite this, I would definitely recommend this book.